WHAT A SURPRISE THAT GEORGE ZIMMERMAN FINDS HIMSELF IN TROUBLE AGAIN … THIS IS ZIMMERMAN’S THIRD ARREST IN RECENT YEARS. 31 year old George Zimmerman finds himself in trouble with the law again, this time he was arrested and booked Friday night for aggravated assault and domestic violence with a weapon in Lake Mary, Florida. Zimmerman is accused of throwing a wine bottle at his girlfriend. Seminole County Judge John Galluzzo set Zimmerman’s bond at $5,000, prohibited him from any contact with the victim, returning to her home or entering Volusia County and must surrender all fire arms. What are the odds that Zimmerman will abide by the court’s order? Following his acquittal in the death of Trayvon Martin in 2013, Zimmerman seems to not be able to stay out of trouble. George Zimmerman is due The judge also ordered Zimmerman to pack up any personal belongings the woman may have left at Zimmerman’s home and give them to his lawyer. Zimmerman is expected back in court at 1:30 p.m. February 17, 2015 in front of Judge Donna McIntosh. The 31-year-old was booked around 9:45 p.m. for aggravated assault — domestic violence with a weapon. According to Don West, Zimmerman’s attorney, his client threw a wine bottle during the incident. Zimmerman is prohibited from contacting the victim, returning to her home or entering Volusia County. He must surrender all firearms by Tuesday, but will not have to wear a GPS monitoring device. George Zimmerman — the man acquitted by a Florida jury over the death of Trayvon Martin — was arrested Friday in Florida on suspicion of aggravated assault and domestic violence with a weapon, local authorities said. The 31-year-old Florida man was arrested by police in Lake Mary around 10 p.m. and booked into the John E. Polk Correctional Facility, according to that facility’s website. That facility, like its website, is run by the Seminole County Sheriff’s Office. 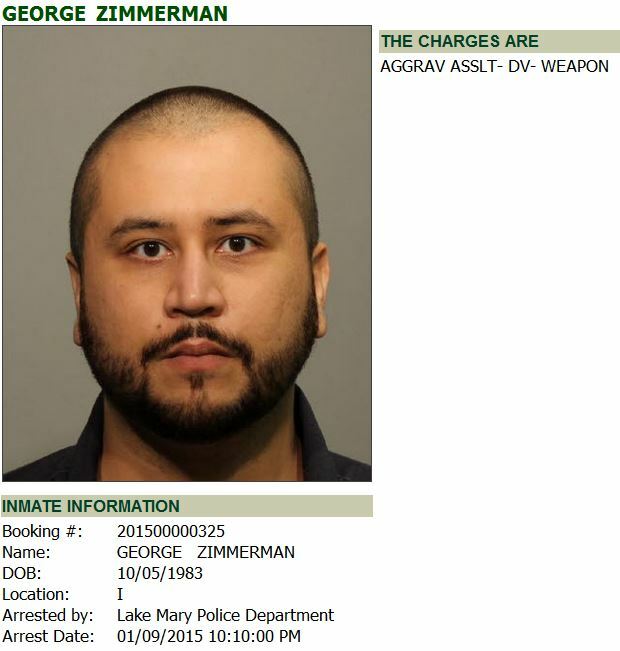 Sun Sentinel – Lawyer: George Zimmerman charged after throwing bottle of wine at girlfriend. George Zimmerman faces charges of aggravated assault with a weapon after allegedly throwing a bottle of wine at his girlfriend earlier this week, according to his lawyer. Zimmerman, 31, was arrested Friday night in Lake Mary where he is currently living, but his attorney Don West said the fight involving his girlfriend happened four or five days ago. Lake Mary Police spokeswoman Officer Bianca Gillett said the fight happened at Zimmerman’s Valley Wood Way residence in Lake Mary on Monday night, but nobody involved called the cops. Police found out about the fight when they pulled Zimmerman’s girlfriend over for a routine traffic stop, Gillett said. More information about the incident was not immediately available. Wearing blue scrubs and Crocs, Zimmerman stood before Judge John Galluzzo this morning where a $5,000 bond was set. It’s unclear if and when Zimmerman, who is currently unemployed, will post bond. West said he was not going to pay Zimmerman’s bond. Even though this incident didn’t involve a firearm, Galluzzo told Zimmerman that he had until Tuesday to surrender any firearms in his possession. Interestingly Zimmerman’s purported girlfriend would take to facebook after Zimmerman’s arrest where she left a revealing message ….